Here are 6 artefacts that caught my eye on a recent early Saturday morning visit. They aren’t the largest or the most prominent, but they stood out for me for various reasons. You can probably cover the whole exhibition at a reasonable pace in an hour, and even less if you just look for these 6 and then go for brunch. CIA runs till 11 September, and it’s worth a visit for the sheer number of countries represented and the level of artistic mastery on display. This 19th Century pendant made me stop and stare. I have never seen such a large shell carved in such great detail. The scene is of the Virgin appearing to the Capuchin monk Isidore of Seville in 1703 and there are two lines of inscription. The line at the top translates to ‘Under your protection, we seek refuge, Holy Mother of God’, while the line at the bottom reads ‘La divina pastora’ (divine shepherdess). Because of how the light fell on the artefact, I had to keep shifting angles to look at the pendant, much to the amusement of the gallery sitter. Just so amazed that anyone can put so much detail on a shell. 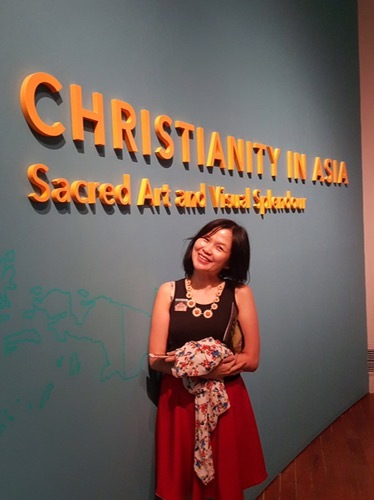 The entire CIA exhibition examines the influence of Asian artforms and traditions on Christian stories and images in the spread of Christianity in Asia. 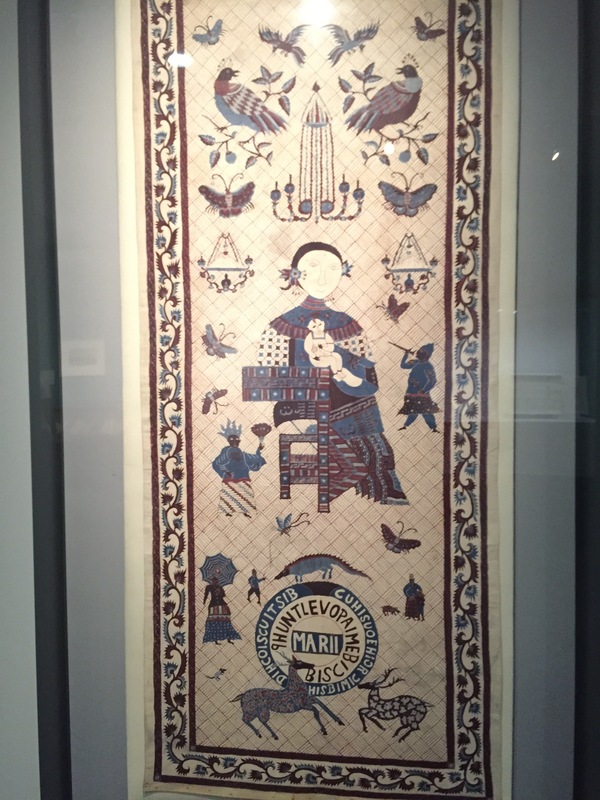 Like the various ways the Virgin is depicted across cultures, the way biblical characters and figures were depicted were also translated according to the local contexts. 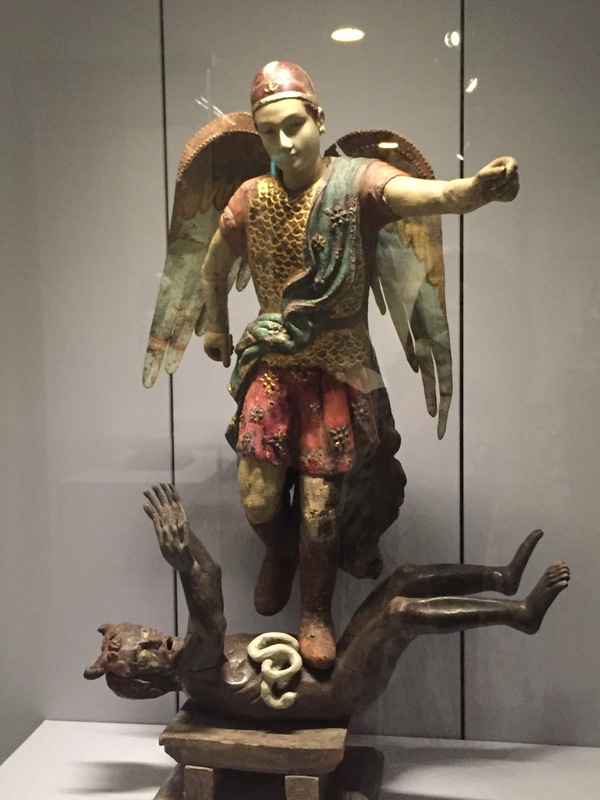 In this graphic 19th Century figure from Northern Vietnam, the archangel Michael is dressed as an ancient Roman warrior, but has a decidedly Vietnamese face. This statue presumably once decorated a church. A very visual reminder of the Last Judgement, I must say. Check out the intestines spilling out! The contrast between the archangel’s bright armour and confident stance and Satan’s agony and abject defeat is really stark. This very innocuous-looking banner with the message ‘Jesus is coming again’ in Chinese belies a violent local incident that is seldom spoken about. In 1851, a violent feud broke out in Singapore between Chinese secret societies and the Chinese who had converted to Roman Catholicism. Gangs attached plantations belonging to Chinese Christians, resulting in about 500 deaths. 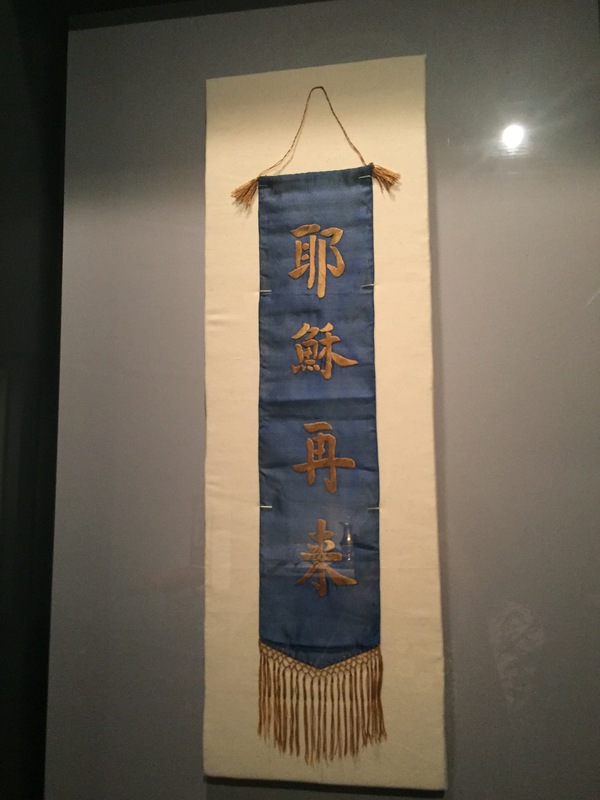 This banner was seized during that period. I first came across this piece of history when I was training to be a docent and was quite stunned at the death toll. To quote a 1878 Business Times review of Lee Poh Ping’s ‘Chinese Society in Nineteenth Century Singapore’, “past events , like old sins, have long shadows”. I’ve always wondered why I haven’t really seen any batik that’s more…well, kitsch, for the lack of a better word. And then I saw this and laughed. Originating from Indonesia (Pekalongan, Java), this piece is amusing because it tries to be many things to many people. The mother goddess image is meant to refer to either the Christian Virgin Mary or “the child-giving Guanyin” (in turn a Chinese adaptation of the Indian bodhisattva of compassion, Avalokiteshvara). And then there is the misspelled Marie biscuit logo, to appeal to those who like the (imported British) snack. It’s an attempting at capturing the Buddhist, Christian and possibly expat market. Or just people who like Marie biscuits in general. I did a double-take when I read the panel text. A boot! Of Saint Francis Xavier! From 16th Century Europe! That is some incredible workmanship! It’s thought to come from a Portuguese man who took one of the saint’s boots at his burial (which might mean the poor man was buried with one shoe, unless someone took the other side). The boot later given to the Society of Jesus (which SFX founded) in Portugal. 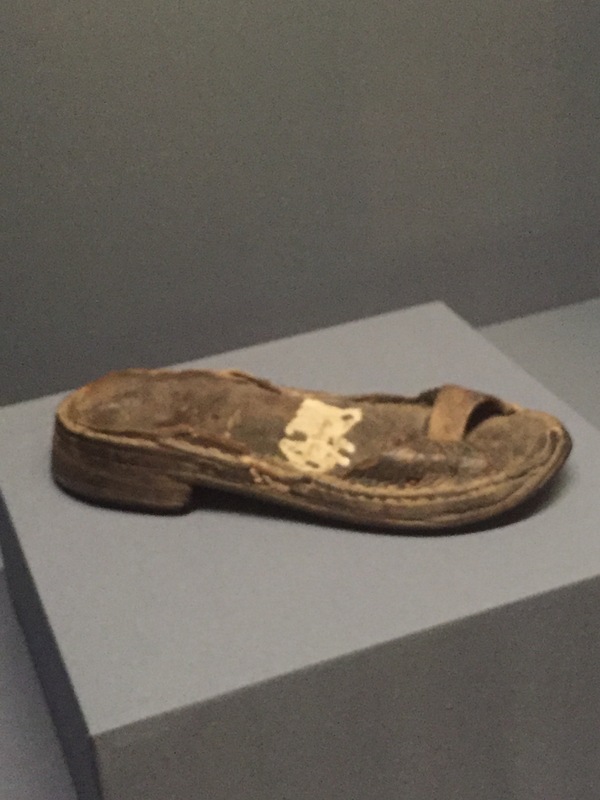 Although fragments were cut from it over the years to create additional relics, I was blown away by the fact that a 500-year-old boot is in such great shape when my own shoes barely last more than a couple of years, if I’m lucky. 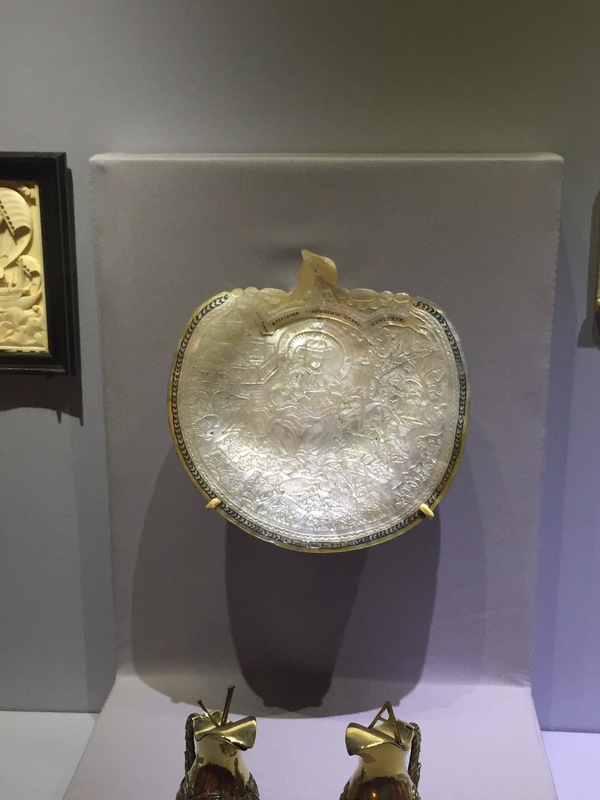 This 1590 artefact from Beijing, China is tucked away in a corner, which probably is apt, considering the story behind it. In the text, the Pope introduces Jesuit emissaries from Rome and requests permission for them to carry out missionary work in China. 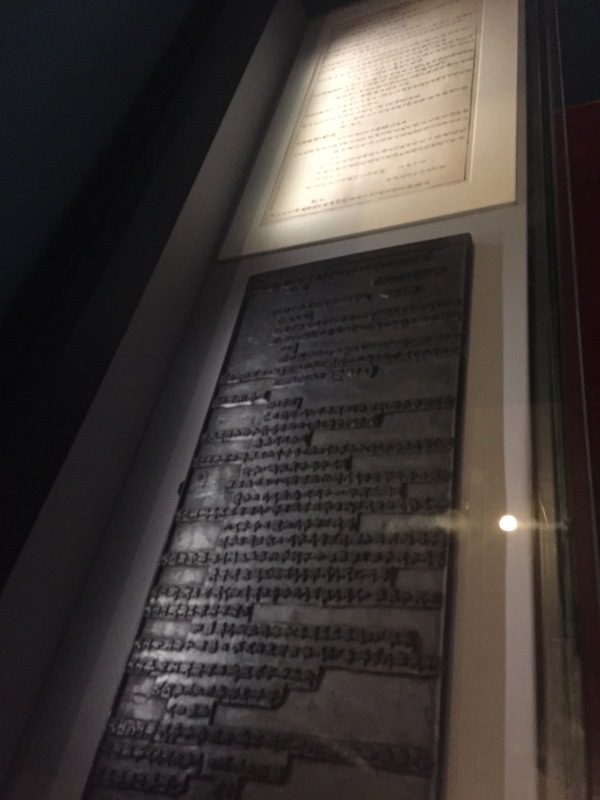 The woodblock was carved in Beijing and sent to Rome to be used on an official trip to the Chinese court. However, Pope Sixtus died soon after the letter was prepared and the next three years all died within two years. So the letter was never actually sent. Looking at the rows of text, I felt nothing but empathy for all the scribes who laboured long and hard over each character choice, and who probably went through draft after re-draft of the letter, only to have it not go through eventually.